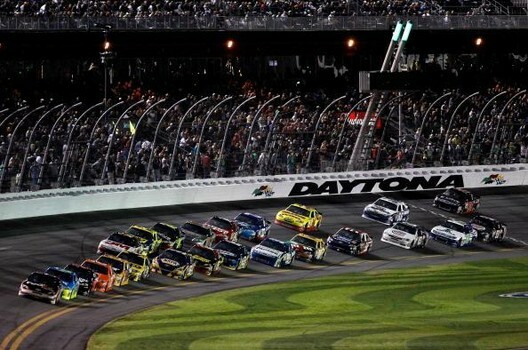 DAYTONA BEACH, FL – This year’s Daytona 500 looked like it was going to be different. With Danica Patrick achieving what no woman has achieved before, placing on the pole at the 500, and the introduction of the new sixth generation cars, we were looking for something different…. But, it turned out not to be that different at all. As is the norm on the superspeedways, the strategy of the day was single file drafting, minimal passing and try to not be in the wrong place at the wrong time. Jimmie Johnson managed to be at the right place at the right time - at the front of the pack at the end of the race. With some help from Denny Hamlin, Johnson took the lead with 10 laps to go and remained in front for the rest of the race. 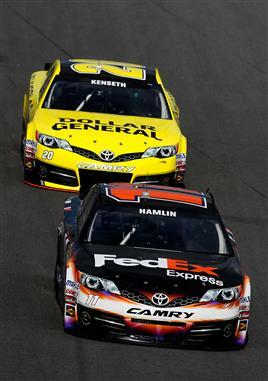 Hamlin finished second followed ever-so-closely by Brad Keselowski. Danica started strong from the front row along with Jeff Gordon. Danica’s team owner, Tony Stewart was right behind her giving her the moral support she needed. She really did a splendid job finishing in 8th place. I think Danica showed the fans, and the other drivers, what she is capable of and she won’t just be a pretty face in a bikini (though I hope she doesn’t stop wearing them!). The face of NASCAR will forever be different. 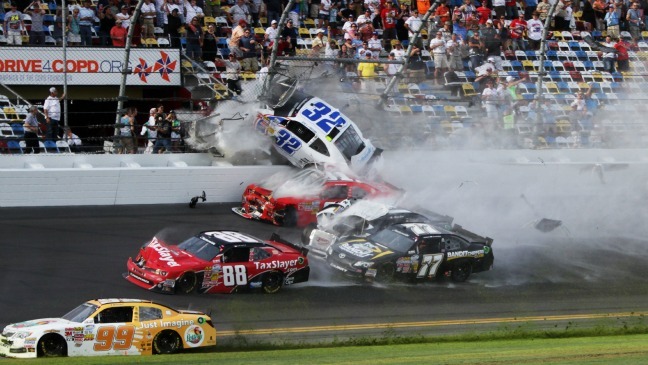 Other big news of the weekend was the crash at the Nationwide race on Saturday during which Kyle Larson’s 32 car flew into the fence separating the fans from the cars. 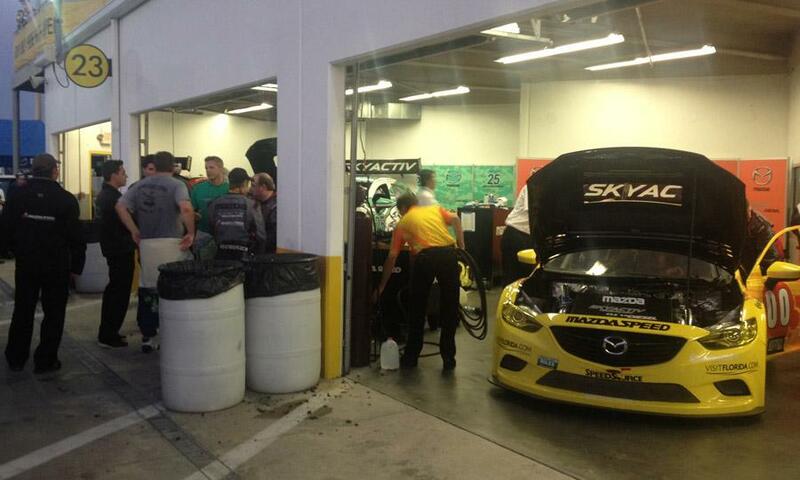 Unfortunately, some debris, including a wheel, from his car landed in the grandstand. 28-33 fans were injured, with 14 requiring a trip to the hospital. 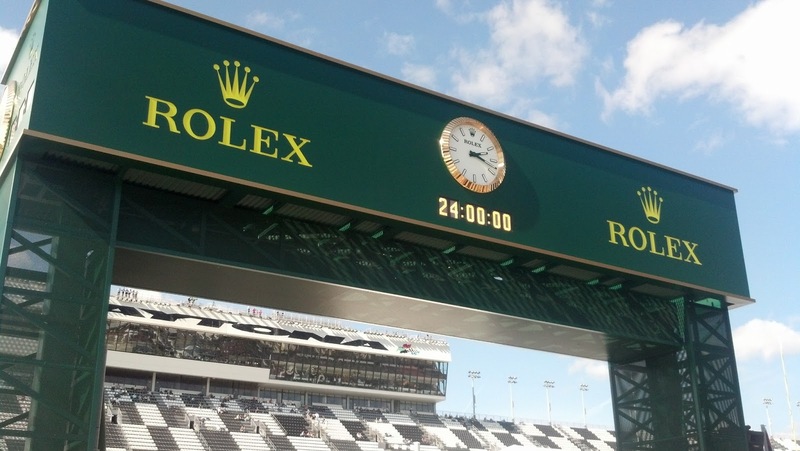 In the midst of spectacular Florida winter weather, the Rolex 24 Hour race was won by The Ganassi BMW-Riley piloted by Montoya/Pruett/Rojas. The WTR DP Corvette of Angelelli/Hunter-Reay/Taylor came in second followed by the Michael Shank Racing Ford-Riley of Allmendinger/Ambrose/Negri. The Action Express DP Corvette of Barbosa/Frisslle/Rockenfeller was fourth but was in contention for the win many times in a race with a total of 74 lead changes. 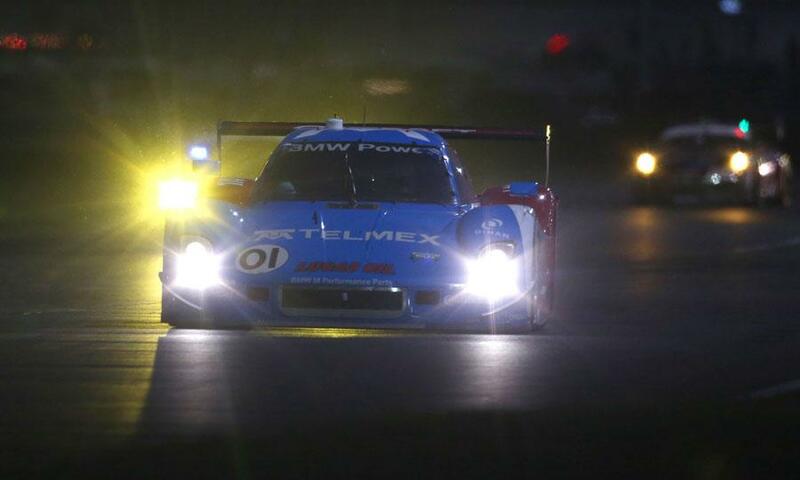 In the grueling 24 hour race, the BMW-Rileys appeared to dominate. Not only did they qualify 1-2 on the grid, had the BMW-Riley of Franchitti not dropped out with driveline issues at about the 20th hour, it may also have been a 1-2 finish for Ganassi and company. The BMW powered prototypes set the pace for the race. But in 24 hours, being fast does not always mean a good finishing position. In late-breaking news, Michael Shank Racing has been fined $35,000 dollars after their Ford-Riley was deemed to be illegal. Apparently, the engine had mechanical adjustments resulting in “performance levels outside the documented maximums.” GRAND-AM had earlier issued new “Balance of Performance adjustments” that limited the rpms for the Fords by 300 rpms, and increased the revs of the Chevrolets by 100 rpm with an added air restrictor. Could it be that the Shank crew forgot to change the rev-limiter, or were they just upset with the changes? The top-three finishing cars were impounded and are being sent to the NASCAR technical facility for further inspection. In GT, it was an impressive performance by the Audi R8s. 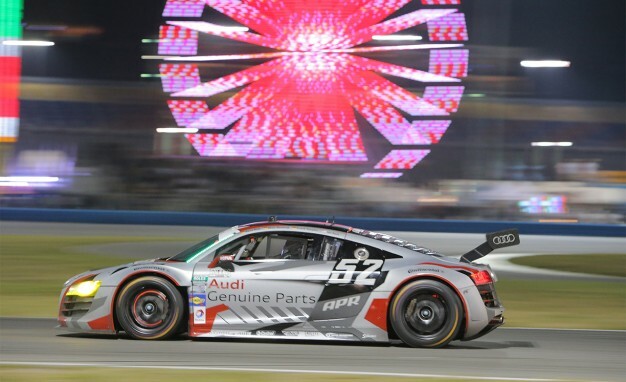 The Alex Job Racing Weathertech entry placed first followed closely by the APR Motorsport R8. It was an emotional win for Alex Job. "I had no team orders," Job said. "My goal was to win, No. 1 for WeatherTech, No. 2 for AJR, and do the right job for both brands. I explained that to Porsche and I explained that to Audi. We went after it that way.” He continued, "It was a little anti-climactic at the end. We didn't finish 1-2. 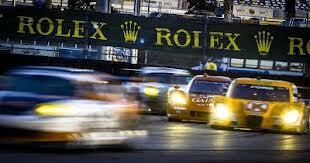 The Audi clearly had the speed and was positioned to win. We were on a different strategy with the other car and it didn't quite work." The Ferrari 458 Italias placed 3rd and 4th with the Michelotto entry having the advantage. 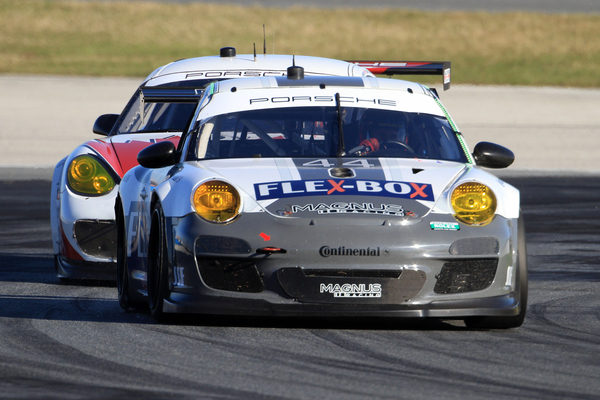 The Magnus Porsche GT3 was the highest placing Porsche in 5th place. The GX class pitted Porsche Cayman’s and turbo-diesel powered Mazda 6s. The Mazdas in their debut had teething problems and retired early in the race giving the privately-developed Caymans a clear shot at podium finishes.